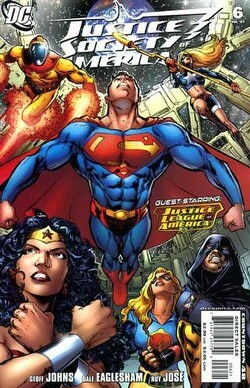 "The Lightning Saga" - Chapter Four: "Three Worlds"
Superman explains to the gathered teams that in the past he and the Legion would interact, even though the last time he saw them was at the end of the first Crisis, and their adventures would often be altered in their memory. The Legion of Super-Heroes fly to an undisclosed location. 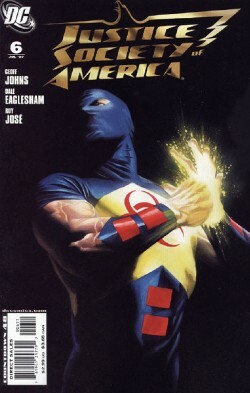 As they do, Starman is revealed (through the other characters) to have traveled the multiverse on the way to this adventure, including his stop in Earth-22, which is revealed to be the Kingdom Come universe. Wonder Woman, Liberty Belle and others arrive before the Legion members, who bide their time and watch as the heroes approach what appears to be the Super Friends' Legion of Doom hideout, but which is actually revealed to be an old Secret Society headquarters. Inside, they find Triplicate Girl, who reveals that they're there to stop Computo, who is destined to change history. Sure enough, Computo emerges, and the heroes do battle, with the reinforcements all arriving and chipping in. One of the three Triplicate Girls is killed. Superman stops the fighting, and reveals that Triplicate Girl was never there, nor was Computo. It was merely an elaborate ruse created by Sensor Girl, who the Legion has now reunited with. The Legion, meanwhile, fly in the night sky toward their mystery engagement, Sensor Girl now in tow. Story - 4: The story continues on, revealing less of the mystery, admittedly, but showing a lot of good action. It fell a little short of typical quality, in that it was a very plot based, somewhat arbitrary story. For instance, most of the action of the piece never really happened, and was essentially one big fan shout-out. Which is cool, but I expect a little character with that from a guy as good as Geoff. Granted, we get some, which is why this is a 4. Starman's reveal is awesome, as is the battle at the Legion headquarters proxy. However, ultimately, the beats are relatively simplistic, and lead to just another Legion character awakening. Given that we know that's the basic premise now, such an elaborate ruse to get to that point seems like just another way to make the Legion seem mysterious and underhanded. I don't know much about the Legion, and this issue doesn't change that. But then again, I didn't need to in order to enjoy it. That says a lot too. I'm interested to hear all of the Earths defined, to see if I can get into the multiverse. Didio's column in the end indicated that they brought it back because they have an intent and purpose. If so, and if it continues in this pattern, I'll really be enjoying it. This comic takes the focus off all of the crazy continuity errors and focuses on a lot of the potential that's new in what now is. Superman remembers the first Crisis now, which is odd. He also worked with the Legion, which is equally odd. Presumably, that means that Byrne Supes, or rather, the cognitive break that occurred with Byrne's Supes, didn't occur. He didn't just jump into a new origin, he jumped into his current origin, and thereby would remember his Silver Age and Golden Age incarnations? Or am I crazy. Just confused, likely, like most of you in that regard. I'm biting my lip and trying to stay patient, over a year after the Crisis. I'm liking the idea of toying with the future, and finding out what the name of Superman means there. It's interesting. And I'm still digging this story, even if this was just the big action piece in the middle. It rocks. I hope they do it once a year, so long as it doesn't co-opt both titles. They need to make this a regular event like before. Art - 4: Eaglesham continues to rock out, though for some reason there's a little less of a distinctive flair in this issue. The two-page spread felt like it should have rocked a lot harder, somehow. But the characters are still great, the action incredibly depicted, and he remains one of my favored artists in comics right now when he's doing action. Cover Art - 3: Meh. Damage is kind of obscure, and his pose isn't that incredibly dynamic or insightful. Nonetheless, it's Alex Ross, and if he did a tissue filled with nasal drippings, it'd probably be so realistic it'd still get a three. I just want to see him doing broad spreads with these characters, action pieces. The character work is beautiful, but I want more.